In our previous post, we graduated from driving a Husky to taking on a Grizzly! Now it’s time to get down and dirty with what ROS is really made of: nodes! We will first be creating a workspace to work from, then we will write a simple publisher that will make our virtual Husky drive around randomly. 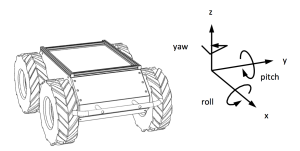 If this is your first time visiting a Clearpath Robotics ROS 101 blog, get started here. Before we begin writing a node, we need to create a workspace and a package. Workspaces are simply directories to store all of your packages. First we will need to create a new directory. This created a directory in your home folder, which we will use as a workspace directory. We now need to create a subdirectory in your workspace directory to store all your source code for your packages. The last step to creating the workspace will be to initialize the workspace with catkin_init_workspace. Now that our workspace has been created, we will create a package in the src directory we just created. This can be done by navigating to the ~/ros101/src directory, which you should have already done in the last step, and using the catkin_create_pkg command followed by what we want the package to be named, and then followed by what other packages our package will be dependent on; this command creates another directory for your new package, and two new configuration files inside that directory with some default settings. You can see that this created CMakeLists.txt and package.xml inside the random_husky_driver directory; this is also where you will store all your source code for your packages. The roscpp and std_msgs dependencies were added into the CMakeLIst.txt and package.xml. As mentioned in our previous post, a publisher publishes messages to a particular topic. For this tutorial, we will be publishing random commands to the /husky/cmd_vel topic to make your Husky visualization drive itself. Start by creating a file in your ~/ros101/src/random_husky_driver directory called random_driver.cpp, and copy the following code. These lines includes the headers that we are going to need. The <ros/ros.h> header is required for ROS functionality and the <geometry_msgs/Twist.h> is added so that we can create a message of that type. The first line, ros::init, is used to initialize the ROS node, and name it “random_husky_commands”, while ros:NodeHandle starts the node. Publishing a message is done using ros:Publisher pub=nh.advertise, followed by the message type that we are going to be sending, in this case it is a geometry_msga::Twist, and the topic that we are going to be sending it too, which for us is husky/cmd_vel. The 100 is the message queue size; that is, if you are publishing message faster than what roscpp can send, 100 messages will be saved in the queue to be sent. The larger the queue, the more delay in robot movement in case of buffering. Therefore in a real life example, you will want to have a smaller queue in the case of robot movement, where delay in movement commands are undesirable and even dangerous, but dropped messages are acceptable. In the case of sensors, it is recommended to use a larger queue, since delay is acceptable to ensure no data is lost. ROS is able to control the loop frequency using ros:Rate to dictate how rapidly the loop will run in Hz. rate.sleep will delay a variable amount of time such that your loop cycles at the desired frequency. This accounts for time consumed by other parts of the loop. All Clearpath robots require a minimum loop rate of 10Hz. The ros::ok function will return true unless it receives a command to shut down, either by using the rosnode kill command, or by the user pusing Ctrl-C in a terminal. 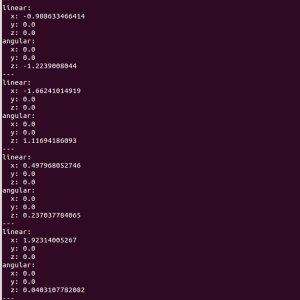 These lines calculate the random linear x and angular z values that will be sent to Husky. We are finally ready to publish the message! The pub.publish adds msg to the publisher queue to be sent. Let’s bring up the husky visualization as we did in a previous blog post. The final step is to source your setup.bash file in the workspace you have created. This script allows ROS to find the packages that are contained in your workspace. Don’t forget this process will have to be done on every new terminal instance! It’s now time to test it out! Make sure you have a instance of roscore running in a separate terminal, then start the node. You should now see Husky drive around! In a new terminal window, we can make sure that our node is publishing to the /husky/cmd_vel topic by echoing all messages on this topic. You should now see a stream of random linear x and angular z values.